Light is entering the scene from the sun above, diffused by the clouds. God is present, of course. 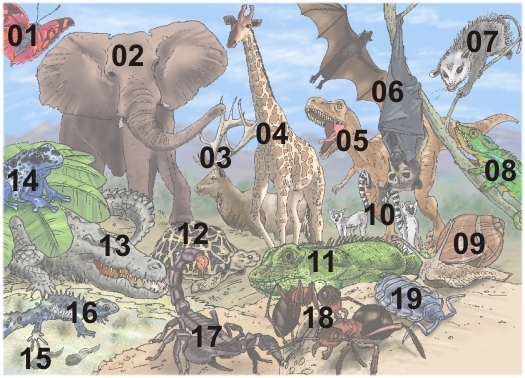 See below for the list of animals present in this scene. Invertebrates – animals that lack a backbone. Invertebrates account for more than 97% of all species alive today. They include animal groups such as sponges, cnidarians, flatworms, molluscs, arthropods, insects, segmented worms, and echinoderms as well as many other lesser-known groups of animals. 1) Agnatha – jawless fish that do not have scales which are the lampreys and hagfish. 2) Chondrichthyes – rough cartilage vertebrates rather than bone, such as sharks and rays. 3) Osteichtyes – bony fish. This group includes almost all fish. Skeletons are made of mostly bone. Includes: Sunfish, Catfish, Minnows, Perch, Goldfish, and most others, like tuna, bass, and salmon. 4) Amphibia – These animals have smooth skin, and most spend at least part of their life in water. Amphibians are cold-blooded. They usually have three life stages: egg, larva, adult. Includes: Frogs, Toads, Salamanders, and Newts. 5) Reptilia – These animals have dry, scaly skin that does not need to be kept wet. They are cold-blooded. Most reptiles lay soft-shelled eggs, but some bear live young. Includes: Lizards, Snakes, Turtles, and Crocodiles. 6) Aves – Birds are warm-blooded. They have hollow bones and feathers. Most can fly at least short distances. Birds are born from hard-shelled eggs. Includes: Raptors, Gulls, Songbirds, and Fowl. 7) Mammalia – These animals usually have hair/fur. They give birth to live young and feed their young with milk. Mammals are warm-blooded. Includes: Rodents, Hoofed animals, Marsupials, Bats, Rabbits, Weasels, Raccoons, Bears, Dogs, and Cats. 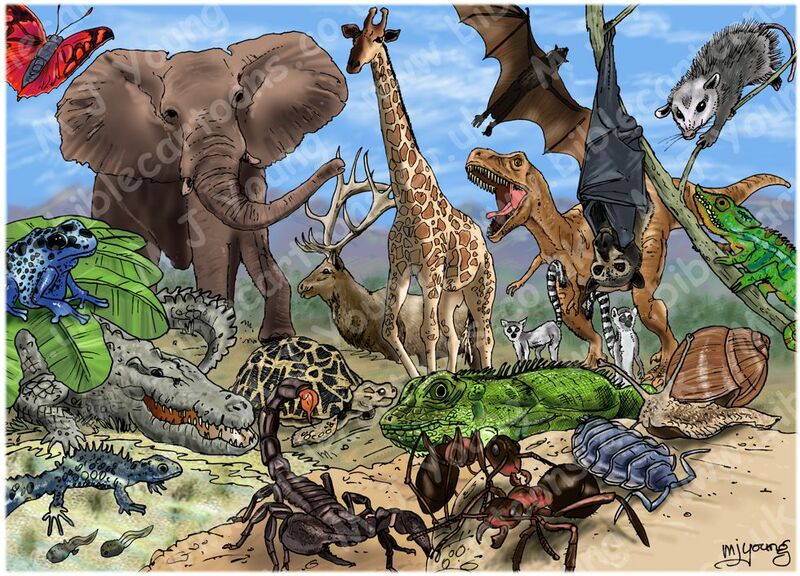 I have drawn representatives of groups 4, 5 & 7 (Amphibians, Reptiles & Mammals) in this scene.